When the Oregon School Activities Association (OSAA) shook up high school sports leagues two years ago, Forest Grove and the four Hillsboro-area schools were not happy. Now, they are preparing to do something about it. They are making plans to ask the OSAA to create a new 6A league (schools over 1,260-student enrollment) comprised of Forest Grove, Glencoe, Century, Liberty, McMinnville and Newberg, and possibly one more school. Hillsboro High School is a smaller 5A (710-1,269 students) school and could choose to move up to play in the proposed 6A league. We want a league similar to old Pacific Conference that had long time rivalries with Hillsboro, McMinnville and Newberg that went back to the 1920s, said Doug Thompson, Forest Grove High School athletic director. They current OSAA classificationss will last through the 2017-18 school year. The exact timing on when Forest Grove and allied schools submit their request to the OSAA is being determined, Thompson said. 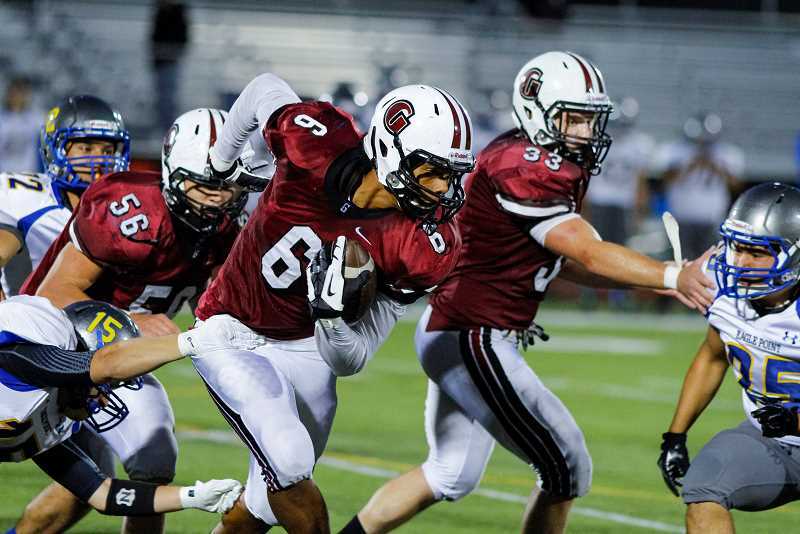 Century, Glencoe and Liberty want to get out of the power-packed Metro League, mainly because it is overwhelmingly dominated by bigger enrollment public schools, Beaverton, Sunset and Westview and mega-power Jesuit. Some Hillsboro schools are getting wiped out in sports, especially football, said Rian Petrick, Hillsboro School District director of Extra Curricular Programs, who oversees athletic programs for Century, Glencoe, Hillsboro and Liberty. Hillsboro is the 5A Greater Oregon Conference. If a football team can get into the playoffs, and then gets blown out, they can swallow it, but getting blown out eight straight regular-season games in a row -- is whole different level of suffering for kids, Petrick explained. And the blow outs are getting worse. A final score of 35-0 in high school football was considered a rout in the 1970s, 1980s and 1990s, but in recent years in the Metro League, a 35-0 score is common midway through the second quarter. The reasons go beyond enrollment imbalance and also include faster synthetic fields and the pass-happy spread offenses, but the demoralizing results are real and far-reaching on boys. Some Metro League schools, despite having 700, 800 and 1,000 boys in the school, are having difficulty getting enough interest to fully field the freshman and JV teams, Petrick said. Travel and traffic is another hassle, Thompson said. We can take the back roads and sometimes get to Salem faster -- 50 miles away – than it would take to get to Jesuit and Beaverton (only about 15 miles away), he said. When the OSAA in 2014 expanded the number of enrollment classification from four to six, it broke up the old Pacific Conference. OSAA policy makers considered shifting Forest Grove into the Metro League, but Thompson vehemently and successfully opposed that. Instead, the OSAA offered a compromise whereby Forest Grove would join the new Greater Valley League, of McMinnville, South Salem, North Salem, McKay, McNary, Sprague, West Salem, West Albany. Viking boys and girls teams have been competitive in the Greater Valley League sports, other than football, but Thompson wants out. Grove student attendances at away games also used to be several hundred students for local games at Glencoe or Hillsboro but has dwindled to almost nothing at road games to Salem. Restoring league rivalries with the Glencoe, and regular non-league games with Hillsboro would increase community and school enthusiasm and be more a equitable athletic match for Forest Grove football, than some of the Salem schools which do well in the 6A playoffs. Petrick cites an experiment with Glencoes football team this season as another reason for leaving the Metro League. After Glencoe went 0-9 in 2015 and turnout forecasts were perilously low for 2016, the school received OSAA special permission to leave Metro league, for football purposes, and play independent schedule in 2016 against 5A and smaller 6A teams as disparate as Benson, Corvallis and Eagle Point. The Crimson Tide finished the recent season with a 4-5 record, and Petrick smiled about that. Glencoes golng independent unleashed a lot of positive energy into the whole school this year, he said. The players knew that if they practiced all week, when they stepped onto the field they actually had -- some chance -- to win, he explained. Glencoe will remain football independent for the 2017 season, and then, hopefully, be able to compete 6A in a new Hillsboro-area/Forest Grove league after that, he said.